I am in the process of slowly removing chicken from my life. It has been a good friend, and an awesome source of protein that can be thrown together in a meal quite easily, however in my quest to optimise my health, I can’t hide from the simple fact, chicken is just too high in Omega 6 (n6) polyunsaturated fatty acids (PUFA’s). There are a couple of studies out there that have details on the fatty acid profile breakdown of various meats, however the one I used for the graphics below can be found for free here. To produce the graphs I averaged the percentages over all three muscle samples. I removed elk as I wanted to focus on meat that is more common. Taking a look at the actual breakdown of the PUFA breakdown we can get a ratio of each animals respective amount of n6 and n3. As you can see from this graph, the ratio of n6:n3 in chicken breast over 18! That is over triple the amount of GRAIN-FED-BEEF. Blow your mind? It blew mine. What this is saying is that you are better off eating some grain-fed-beef steaks rather than chicken if you want to lower your n6 intake. But what about so called free-range-chicken you ask? Well first of all, it is nearly impossible to get true free-range-chicken which has not eaten some grains. They are too small and light to be commercially viable and need grains or other feed. But even if you do manage to find some, it would most likely not reduce the ratio by more than a 3rd and even then it will still be marginally better if you went for GRAIN-FED-BEEF. 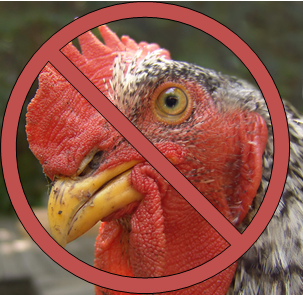 Well personally I think the paleo diet is strange enough for most people to adopt without then telling them to remove chicken from their life. However, for those who really want to optimise their health, this is another step they can take. Your statistics seem to show the PUFA percentages for range vs. feedlot cattle and bison but only one kind of chicken breast. What about the info on pasture raised chicken vs. conventionally raised chicken? I would bet the percentages would be different. That’s an excellent point, DajM, I was going to ask the same thing — and also, I wonder about a better mix of muscle type. Our family eats only pastured hens and those only as whole birds. I have a hunch our intake may have a very different pofile from CAFO chicken breasts. But even if you do manage to find some [pastured chicken], it would most likely not reduce the ratio by more than a 3rd and even then it will still be marginally better if you went for GRAIN-FED-BEEF. If you are going to eat chicken, go with lean cuts. I’d be curious as to how other kinds of poultry compare. Ducks and bantam hens eat a lot more insects and snails than chickens do, and geese are predominately grazing animals. My birds only get whatever grain they can steal from the pigs, apart from that they are on their own! Previous post: N = 1; Probiotic’s and my mood. Next post: KFC Double coming to Oz!